So, I decided to buy a backup inverter, just in case the Jupiter failed. 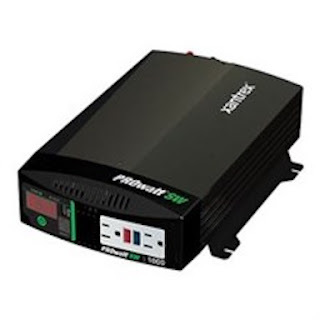 The inverter that I chose is a Xantrex PROwatt SW600 - True Sine Wave Inverter [Link]. I've had good experiences with Xantrex inverters. MsTioga's solar electric system used a Xantrex Inverter/Charger which worked great. This is a momentous day! I phoned RBP Auto Collision Center, a Progressive Insurance approved repair shop. All I wanted to find out was how long it would be to begin repairs on Señor Tránsito. But a strange thing happened when I phoned RBP. The person who answered my phone call sounded like a guy from Mexico. He had a strong accent. I got the impression from talking with this guy that RBP was a very small shop. "How much time it would take to begin repairing my collision damage?" "Bring it over! We'll get right on it!" "You actually are able to begin today?" "We have a Progressive Insurance estimator right now in the office back there [She pointed to that office]. "Just leave your vehicle here and we will get right on it." My brain was now racing! I wondered how this could work? I phoned U-Haul and asked if they had a van with a hitch. They did not have a van with a hitch. But they did have a pickup truck with a hitch. I told the U-Haul guy that I was on my way there! "I'm going to rent a tow vehicle from U-Haul. I'll be back here with my Ford truck in an hour." Out in the mountain states of Wyoming, Montana, and Idaho where the Scampy has been RVing since last May, there no 24 Hour Fitness gyms to be found. Here in the City of Beaverton Oregon, there are 3-gyms. The gym that I exercised in this evening has excellent equipment. The showers have very good spray heads and the shower valve works like it should [Not all 24 Hour gym's have showers as good as this one!]. Xantrex makes very good products. I have used a pure sinewave for years. Remember that every 100 watts or so is about 10 amps draw from the battery (assuming about 80 something percent efficiency), so a 2000 watt load at 110 AC would pull close 200 amps at 12 VDC. I doubt you have enough battery capacity to sustain that for very long, so an air conditioner is out of the question. There's probably no other single load that big, so smaller unit(s) should suffice. Also, big inverters consume a fair amount of power even when unloaded. I think it's best to stick to the 600 watt types. For the price of a good 2000 watt unit,you can probably buy 4 or more 600 watt units and have better scalability and reliability. We purchased our Xantrex 1,800 Watt Pure Sine Wave Inverter back in 2007 to use for our CPAP Machines (Keeps us breathing at night) This is the Third RV we have moved it to. It was used to power Three CPAP Machines for a short period and it has never let us down. Driving this GMC pickup truck has opened my eyes to spending my time driving various trucks to determine how they compare.